The preference for vacation rentals over hotels has skyrocketed in the past few years, and it’s understandable why. Travelers are seeking vacation experiences that ignite their souls and make them feel more like locals than visitors. 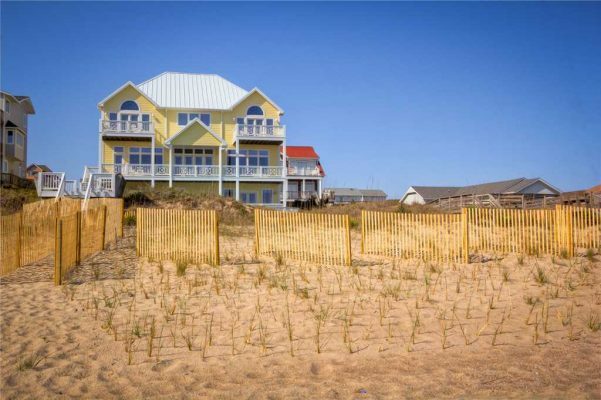 Emerald Isle Realty vacation rentals give travelers the opportunity to step back from the day-to-day, and lounge in the comfort of a coastal experience. With the added benefits of unique amenities, privacy, savings, and plenty of room for your entire group including pets, a vacation rental is the accommodation for you! The easy-going atmosphere is the perfect setting for a wide range of tailored rental experiences to match your unique needs – because unlike hotels, one size doesn’t fit all. Here’s a closer look into why a vacation rental offers a better coastal experience than a hotel. Beach vacations should be easy and breezy so make your vacation exactly how you want it, with the convenience of customizing your accommodations to satisfy your wants and needs. Enjoy the feeling of knowing that you’ll always have a personal point of contact to provide excellent customer service, instead of sharing one contact for the entire hotel. Emerald Isle Realty is at your beck and call, like your own personal travel agent, to help find the most suitable vacation home. You can also use our online Search Tool to pick from a list of potential locations based on your group size or vacation interests. From condos and cottages to larger oceanfront and luxury properties, there’s bound to be a perfect fit. And don’t worry about boarding your furry friend; bring them with you! Many of our properties are pet-friendly, so let them run around in your own backyard. Hotels have limited accommodation options for large families or groups, so you might be faced with renting out more than one room and multiplying the price per night. But vacation rentals can be as big or as small as you like, so you’ll get a fair price for what you need. Even smaller vacation rentals provide more space than a hotel room, so you can stretch out and relax. Relish in the wide-open walkways, porches, living rooms, and lounge areas, and make it homey by unpacking your clothes in much larger closets than the ones you find in hotels. Save your money. Some of the best dinners on vacation happen inside the house. Instead of going out to eat three times a day, enjoy the luxury of a full-service kitchen, open counter spaces for cooking meals, and a family-sized refrigerator for stocking up on groceries. It’s no secret that most family time happens in the kitchen and with kitchens being a mainstay amenity in every vacation rental, you will not miss a minute of it. If you’re the “treat yourself” traveler, a luxury vacation rental is perfect for you. You will have access to your own master bath suite with ocean views, stunning design elements, & plenty of room to pamper yourself. When it’s the kids’ bedtime, don’t stress about having to go to bed when they do. Enjoy the ability to put the kids to bed in another room while you can relax with a glass of wine and a movie. Sure, hotels provide certain amenities – but you’re probably sharing them with hundreds of strangers. Vacation rentals provide those same amenities, and most of the time even more. Except, instead of sharing, you get them all to yourself! When you first arrive, don’t worry about lugging all your personal items to and from a public parking lot; enjoy the convenience of your own driveway, only steps from the front door. During the day, lay out on the dock in your own peace and quiet, and at the end of a hot day, go for a swim in the private pool or hot tub, grill outside with friends and let the kids have fun in the game room without worry. Bathing suits and sunscreen-drenched clothes are bound to happen, but when they do, just throw them in your own private washer and dryer. While this gives you the opportunity to pack light for your trip, all of the storage and closet space makes overpacking easy. Most importantly, it’s hard to capture the feeling of being away from the hustle and bustle of the outside world in a hotel. Hotels don’t offer the same connection to the location that vacation rentals can. When you walk into a hotel, it follows the same style and structure of thousands of other hotels, while vacation rentals offer a one-of-a-kind experience. From variety in color, finish, style and interior design, to the history and stories behind each property, there’s authenticity woven into every square inch and stitch. At the end of the day, our vacation rentals are homes and we want you to live in them like they’re your own. Redefine what it means to take a family vacation and enhance your stay here in Emerald Isle! Check out our Seasonal Offers and experience the true beauty of coastal living for your next beach getaway.